Subtitled "From the Origins of Civilizations and Religions to Humankind's Final Destiny"
Has our history been fundamentally influenced by a hidden alien agenda? The author of this well-written and thought-provoking book believes so. His interest in some form of external intervention was derived from his studies of the Fatima event in Portugal which took place in 1917. Dr Kulczyk has a PhD in laser applications, and he set about interpreting what may have happened during that summer on the Iberian peninsula using his specialist engineering background. He was impressed by the case because of the large number of eye-witnesses of a remarkable 'display in the sky' (the "Miracle of the Sun"), and the predictability of each visionary appearance of the figure whom many interpret as the Virgin Mary. He became convinced that the visions were created by a visiting culture whose engineering prowess enabled the phenomenon through utilising advanced laser technology, combined with an undeniable penchant for theatrics. But his analysis of the Fatima visions remains a strong contender for intervention of some kind. Kulczyk argues that the encounters are neither typical Marian visions, nor are they typical UFO sightings and related phenomena. Ironically, where UFOs are probably not E.T. related, the Fatima events might be, he thinks. But the organisation of such encounters would have to have been extraordinary, even by today's standards. I'm reminded of illusionist Darren Brown's recent experiments at mind-control by creating an immersive but wildly fictional environment for his unsuspecting subject. I can see how aliens with technology and intelligence beyond ours would also be up to the task. Such conjecture is bread and butter to researchers like me. 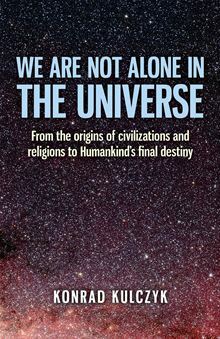 Where I might have taken the book further down that rabbit hole, "We Are Not Alone in the Universe" takes a different path. The bulk of the book is an essentially factual description of some of the grand turning points in history. It takes in the sudden emergence of civilisation in Sumer and Egypt (which the author generously describes as egalitarian societies compared to their more barbaric neighbours). He ascribes their appearance to an import of peoples and knowledge from a proto-civilisation located somewhere in the Caspian Sea area. This zone, he thinks, was visited by the 'intelligent beings' who gifted the peoples of the area with great learning in the art of civilisation-building. The locals migrated, some of whom became the Sumerians who then descended upon the marshlands of Mesopotamia. The chapters which follow describe some of the great prophets, and how the monotheistic religions established themselves. The centre of the book becomes a thesis on comparative religions. Whether this seemed relevant to the claim posed in the book's title is a moot point. Kulczyk provides some useful insights into how the competing religions fitted into history. These religions were seeded by the intelligent beings, he proposes, through visionary experiences similar, presumably, to those experienced in Fatima. Then he looks in some depth at the lives of more modern thinkers, like Nietzsche and Gurdjieff, and how their philosophies might direct humankind towards a future where we ourselves become fully conscious beings, like the aliens who have intermittently moulded our civilisation and development. All of these chapters are well written, balanced, informative and, above all, interesting to read. They contrast with the author's appraisal of the alleged decline in our own society's moral standards, which becomes something of a Daily Mail rant. Statistics can be pretty much used to deliver whatever point you want to make in this area, and the author's usual careful journalistic balance becomes derailed. The focus on religion in the book (and bear in mind that the author is an established scientist) led me to ponder whether he was advocating an alien dimension to angelic intervention. There may be a fine line between the paranormal and the supernatural, if any distinction beyond our biased interpretation exists at all. In the true sense of the word, the purported existence of the intelligent beings could be classified as 'occult'. Their influence is hidden, and is intermeshed with esoteric thought and philosophies. This interpretation may reflect the interests of the author more than any reality that we can hope to establish, given the known scenarios outlined by him, but it would be nice to think that there really are some guardian angels from the stars looking out for our interests as we continue our inexorable progress.